John Kenneth Muir's Reflections on Cult Movies and Classic TV: Cult-TV Theme Watch: RVs. An RV or recreational vehicle is a vehicle (or sometimes trailer) that comes kitted-up with every aspect of the modern home or house. 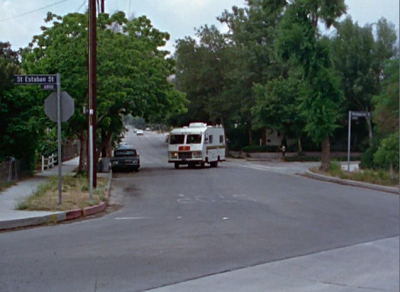 The RV has been the vehicle of choice in several cult-tv series over the decades, especially in narratives that involve characters and families on the run from villains, or otherwise on the move. Rather unconventionally, an RV emblazoned with Captain Marvel’s logo -- a yellow lightning bolt -- is the home base for youngster Billy Batson (Michael Gray) and Mentor (Les Tremayne) in Filmation’s live-action Saturday morning series, Shazam (1974 – 1977). It seems odd that the RV should be decorated with Captain Marvel’s symbol, since his identity is a secret. This would be like Clark Kent driving a car with a Superman “S” on the hood. The TV works of Chris Carter often feature individual episodes featuring RVs. In Millennium’s (1996 – 1999) “Beware of the Dog,” for instance, the opening stinger involves two nice retirees pulling up into scenic Bucksnort in their RV…when fierce canines attack and kill the senior citizens. And The X-Files (1993 – 2002) episode “Bad Blood” involves several vampires from Texas that happen to live in a trailer park, as Mulder (David Duchovny) learns. During the fifth season of Buffy the Vampire Slayer (1997 – 2003), Buffy (Sarah Michelle Gellar) battles an Ancient, all-powerful Goddess called Glory, and in the episode “Spiral” decides to get out of Dodge with Dawn, Giles, Spike and the rest of the Scoobies in an old RV. 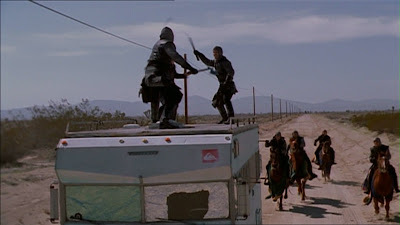 This decision to flee Sunnydale sets- up a road-warrior-ish battle between the racing mobile home and several knights on horseback. In the cartoon series Ben 10 (2006 – 2008), young Ben Tennyson and his cousin Gwen spend a summer vacation riding around America with their grandpa, Max, in his high-tech RV, which is outfitted with “plumber” technology. 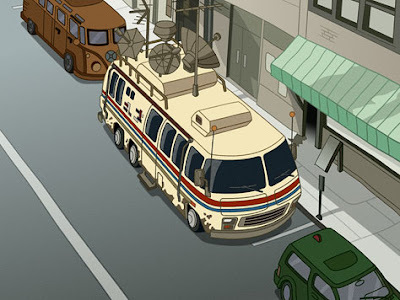 This RV -- affectionately known as "The Rust Bucket" -- becomes the home base for Ben after he first is bonded with the Omnitrix, and granted the capability to transform into different alien creatures. 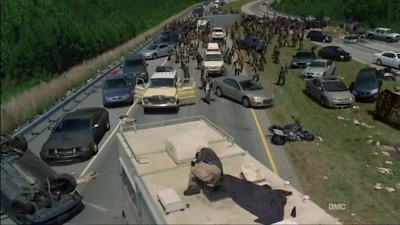 Finally, on the AMC original series, The Walking Dead (2010 – present), kindly old Dale (Jeffrey De Munn) makes his RV the ad-hoc “home” for a group of rag-tag survivors of the zombie apocalypse in Georgia. The van endures for the first two seasons of the series, as does Dale himself. The Master also fits the theme, even if it's not quite an RV (customized van).